I found both of these cameras at the thrift store this week. I think I might be starting a vintage camera collection without consciously choosing too. I just love the way they look, I love the imperfect beautiful pictures they take, and I love imagining all the memories they may have captured over a lifetime of use. I wasn't sure if the Polaroid worked, but it made a funny sound when I opened the top like the flash was powering up. I was playing around with it while the Little Miss was eating her lunch, opening up compartments and pushing buttons when - Click! Flash! - a picture came rolling out! I'm not sure who was more surprised, me or her. I had no idea there was still film inside. 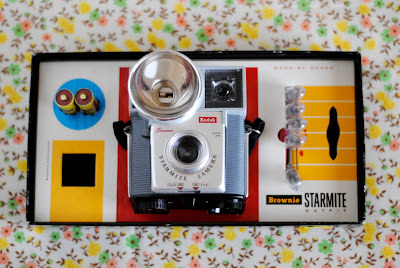 I don't know much about this Kodak Brownie Starmite but I did find out it was made from 1960-63 and uses 127 mm film. So, if I can get my hands on some film we can see if it works (although I have a feeling this one wasn't used very much so it should be in working condition). I love the box. Lucky you! 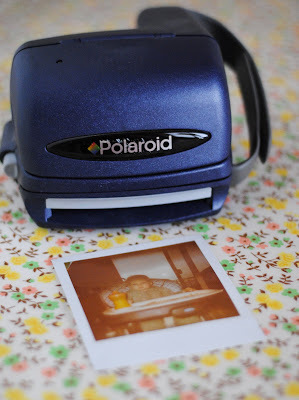 I'm so jealous, I want an instant film camera!